The book Case Studies in Intercultural Dialogue has just been published by Kendall-Hunt. It is edited by Nazan Haydari and Prue Holmes. The book focuses on the important and under-investigated concept of intercultural dialogue. It draws on cases of intercultural communication in which there is a dialogue, conflict or misunderstanding, and presents approaches, theories, and analytical tools that can be used to productively understand and/or resolve the issues presented in each case study. This edited collection covers a wide range of research topics drawn from peace building, arts and media, education, anthropology, new communication technologies organizational communication, and more. 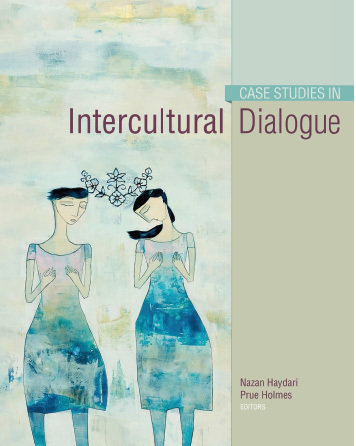 The format of Case Studies in Intercultural Dialogue encourages readers to engage in discussion from different perspectives through various methodological and theoretical approaches to problems, opportunities, and ethical issues of intercultural communication. Anthropology as Intercultural Critique: Challenging the Singularity of Islamic Identity by Tabassum “Ruhi” Khan. We invite submissions for an edited volume on the topic of intercultural dialogue contracted with Kendall Hunt Publishing Company. The growing interest to the concept of intercultural dialogue highlights recognition of the intercultural character of all dialogue processes as they are embedded in and transcend national, political, economic, cultural, religious and historical contexts. It also acknowledges how closely normative assumptions about dialogue are implicated in intercultural communication practices. The volume aims to make a contribution to the field through the diversity of conceptual and methodological approaches, inclusion of various cultures, contexts and examples, and through the contribution of a diverse number of authors. It draws on cases of intercultural communication in which there is dialogue, conflict or misunderstanding, and presents approaches, theories, and analytical tools that can be used to productively understand and/or resolve the issues presented in the particular examples. The collection approaches case studies as both a way to theorize intercultural dialogue, and as a teaching/learning tool. By defining the concept of “case” more broadly as a real life situation—from a well-defined situation taking place at a certain time and place (e.g. conversations, meetings, classroom settings) to series of events, forms of representation, or organizational structures—the collection aims to cover a range of examples from different cultural contexts. The case studies are structured around the idea that intercultural dialogue is an important component of everyday life, and which is practiced at various levels—from interpersonal communication to media, education, business settings, legal work, action in civil society, and national policy construction, etc. The cases are expected to demonstrate the complexity in the dynamics of intercultural communication, culture, everyday, and identity, and emphasize the building of dialogue at individual, interpersonal, group, and institutional levels. Submissions may address a broad range of issues, including class struggles, international journalism, artistic expressions, interpersonal and workplace conflict, media, education, migration, new media technologies, NGOs working on conflict resolution or in conflict-torn areas, popular culture, race and ethnicity, sexuality, religious diversity, social movements, transnational feminist practices, youth cultures, and war. Please send an extended abstract of 1000 words by November 21st to both nazan.haydari@yahoo.com and p.m.holmes@durham.ac.uk . Selected abstracts will be notified by November 30th and full papers (of 5000 words including notes and references) will be due 15th of March 2012. The special issue on Intercultural Dialogue in the Journal of International and Intercultural Communication, 4(2), co-authored by Shiv Ganesh and Prue Holmes, consolidates emerging interest in intercultural dialogue. The special issue emerged from the “Intercultural Dialogue” NCA Summer Conference in Istanbul, Turkey, in 2009. The four selected articles build upon, expand, and critique current understandings of intercultural dialogue, in particular, the important definition established by the White Paper on Intercultural Dialogue (2008). This definition locates intercultural dialogue beyond mere tolerance of the other and situates deep shared understandings, as well as new forms of creative and expressive communication, as dialogic outcomes. The four articles elaborate the terrain on intercultural dialogue in five important ways: 1) by drawing on key theorists of dialogue and intercultural communication; 2) by understanding dialogic encounters as intercultural, embedded in national, political, economic, religious, and historical interests, in order to view social problems in new and creative ways; 3) by engaging reflexively in the dialogic processes occurring in intercultural settings and encounters; 4) by situating the study of intercultural dialogue as an applied and pragmatic endeavour, using theories as resources for good practice; and 6) by explicating ethics as central to dialogic processes, for example, in contexts of social justice and colonization. Witteborn’s paper “Discursive Grouping in a Virtual Forum: Dialogue, Difference, and the Intercultural” investigates how participants, in this case, Uyghur diaspora, construct difference in a virtual forum where difference is an opportunity for dialogic transformation. Witteborn’s analysis reveals that interlocutors mostly confirmed group locations through identity terms, truth talk, and distrust, which prevented dialogue. In reflecting on the meaning of intercultural, she thus cautions not to overemphasize the cultural at the expense of other meanings of group location important to interlocutors. LaFever’s article “Empowering Native Americans: Communication, Planning, and Dialogue for Eco-Tourism in Gallup, New Mexico” emphasizes the importance of finding ways to meet the participartory needs of a marginalised (Navajo) community to engage and support them in public dialogue. Her study highlights the need for continued development of dialogic practices, and for closer ties among communication and planning scholars. Carbaugh, Nuciforo, Saito and Shin, in “’Dialogue’ in Cross-Cultural perspective: Japanese, Korean, and Russian Discourses,” explore terms and practices relating to dialogue in the three discourses identified in the title. Their analysis of the term “dialogue” reveals distinctive goals for communication, implicit moral rules for conduct, and the proper tone, mode, and interactional structure within each discourse. They conclude that cross-cultural knowledge of this kind can clarify and address vexing problems such as the cultural balancing of information and truth with relational concerns. MacLennan’s essay “’To Build a Beautiful Dialogue’: Capoeira as Contradiction” examines the dynamic dance-fight-game of African-Brazilian origins as a metaphor for dialogue. Through text, literature and personal experience, MacLennan reveals how dialogue is constituted through contradiction and paradox. Drawing on co-cultural theory, she reveals the importance of five key contradictions occurring in capoeira that have relevance to intercultural dialogue among cocultural groups. Together, the articles in this collection expand current understandings of dialogue as they seek to explore the potentially dialogic role of conflict as well as consensus and collaboration. As such they inaugurate a productive exchange between scholarship on dialogue and intercultural communication studies, thereby setting an agenda for studies of intercultural dialogue. Prue Holmes is Senior Lecturer in International and Intercultural Education in the School of Education, Durham University. She has also taught intercultural communication at the University of Waikato, New Zealand, and English as a Foreign Language and English language teacher education in Italy, China, and Hong Kong. Her research has been published in international journals and includes, most recently, a special issue on intercultural dialogue in the Journal of International and Intercultural Communication. Current research interests continue to explore intercultural dialogue in expanded contexts such as internationalisation. Other research includes the intercultural communication and learning experiences of international and Chinese students; intercultural competence, immigrant communication experiences; and intercultural education. She has received commissions from UNESCO to research intercultural communication in the Asia-Pacific region, and from Education New Zealand and the Ministry of Education (International), New Zealand, to research international and Chinese students’ learning and intercultural communication experiences. Prue supervises post-graduate theses and dissertations in intercultural communication, identity, and competence; international and intercultural education; English and foreign language education; and Chinese and other international students’ learning and communication experiences. She also teaches modules in international and intercultural education and communication at post-graduate and under-graduate levels. Prue is co-chair of the International Association of Language and Intercultural Communication (IALIC) and will be hosting the conference at Durham University in December 2012.